Homelite was the brainchild of entrepreneur Charles H. Ferguson. In 1921 Charles started Homelite in Port Chester, New York, to cater to the outdoor tool market. Since then, Homelite has been catering to the needs of homeowners and ‘DIYers’ for almost 70 years. Homelite is all about supplying quality outdoor tools that meet the mark and the budget. They offer mowers, blowers, outdoor accessories, hedge trimmers, pressure washers, generators, top handle and rear handle chainsaws, and so much more. If it’s for the outdoors, they most likely have it! Homelite became notable for producing the world’s first one-man operated chainsaw, as well as being one of the largest manufacturers of portable electrical generators after World War II. 14 inch gas powered 42cc chainsaw. 16 inch gas powered 42cc chainsaw. 18 inch gas powered 42cc chainsaw. The Homelite range is aimed towards homeowners and those looking for a reliable saw in either electric or petrol powered form. No matter the job, a Homelite saw is sure to get it done. The electric model can cater to those smaller jobs, whilst the petrol powered saw can complete that winter wood pile with ease. Both kinds are for sale both online and in selected hardware stores. It has a vibration isolation feature to reduce user fatigue. It has an inertia brake chain for added safety. It has clear fuel and oil levels so you know how full or empty it is. It is not a very durable saw. The instructions that come with it aren’t very detailed. The pull start is difficult to use. QCan you run different sized bars and chains on this model? AYou can use up to 16 inches. QWhat kind of fuel do you use with it? A50:1 mix ratio – 2.6 oz 2 cycle engine oil to 1 gallon of regular unleaded fuel. QDoes it cut through metal? ANo it is a wood saw only. ANo, ethanol makes the engine run poorly and voids the warranty. For the homeowner looking to undertake maintenance around the home, look no further than the Homelite 14 inch gas powered chainsaw. Packed full of advanced features without the hefty price tag, this chainsaw is sure to see you through until the end. It does look a little on the cheap side, but it proves itself as a reliable chainsaw for those small trimming jobs. It’s also affordable for most homeowners and comes with a two year limited warranty. Check out what other people who purchased this product think about it. 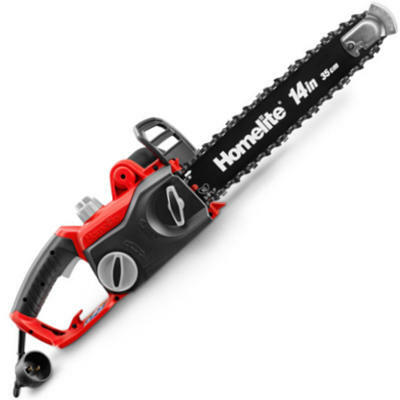 Read Homelite 14 inch gas chainsaw reviews. It comes with a case when most brands don’t. It has an inertia chain brake for added safety. For the cost, you get a lot of features. It’s reliable when used correctly. Some users note the chain arrives dull. Some users say it is not well assembled. The chain comes loose more than it should. QWhat is the maximum diameter this chainsaw can cut? QWhat kind of gas do you use with it? For the homeowner who needs to clear felled trees and create firewood, the 16 inch Homelite petrol powered saw is the best Homelite chainsaw for the money. It cuts well, it’s durable and it’s easy to store, use and maintain. It’s also very lightweight, is the perfect size for around the house and it’s very affordable in comparison to others with similar specs. It also comes with a lot of additional accessories most other manufacturers don’t offer as part of the package. Check out what other people who purchased this product think about it. 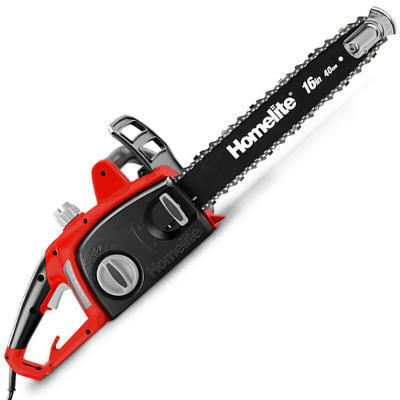 Read Homelite 16 inch gas chainsaw reviews. It isolates vibration to reduce user fatigue. It’s powerful for homeowners and landscapers. It comes with heaps of accessories. It struggles to start well. 32 oz. bar and chain lubricant. QWhat is this saw best used for? QHow large of a tree does it cut through? This chainsaw is undoubtedly the best Homelite chainsaw for the money. Not only does it pack a real punch in power, but it also comes with a large amount of accessories. Being so affordable to purchase as well, you are truly getting the best deal with this chainsaw. It’s the epitome of a good homeowner’s saw, and when maintained and used correctly, will be reliable on the job. Unfortunately it’s not a good saw for professionals, nor is it a commercial grade saw. Check out what other people who purchased this product think about it. 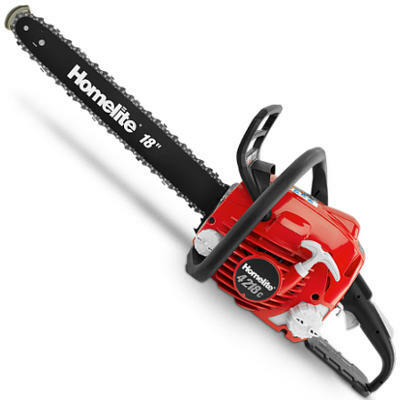 Read Homelite Chainsaw 18 inch gas chainsaw reviews. It can cut trees up to 28 inches in diameter. It’s efficient in the respect it doesn’t require any fuel. It has a wrap-around rear handle for comfortable use. You are limited in your use due to the power cord. You need a heavy duty extension cord. Oil is known to leak. The chain falls off regularly. Homelite 12.0 amp electric chainsaw. QWhat kind of oil do you run in this chainsaw? AHomelite bar and chain oil. QWhat extension cord can I run? A14 gauge 100 foot cord. For the cost of this electric powered chainsaw, you sure do get unbelievable value! Not only do you benefit from the convenience of very little maintenance, but it’s also very powerful for cutting down small trees and cutting up logs. Reviews have been extremely positive about this Homelite electric chainsaw, and it’s clear to see why. It runs faultlessly, doesn’t miss a beat, and considering it’s on the small side, can handle big cuts with ease. It’s undoubtedly one of the best electric chainsaws for the money, on the market. It is, however, best suited to small around-the-house jobs. Check out what other people who purchased this product think about it. Read Homelite Chainsaw 16 inch electric chainsaw reviews. It has a powerful 9 amp engine. It has a lot of safety features. It can cut through 12 inch diameter of wood. It’s not efficient with chain oil. The chain comes loose easily for some users. The motor overheats when pushed too far. Homelight 12 amp electric chainsaw. QWhat extension cord can you run with it? AA standard 16 gauge, 100 foot cable. QDoes it have a variable speed feature? ANo. It remains at one speed – fast. 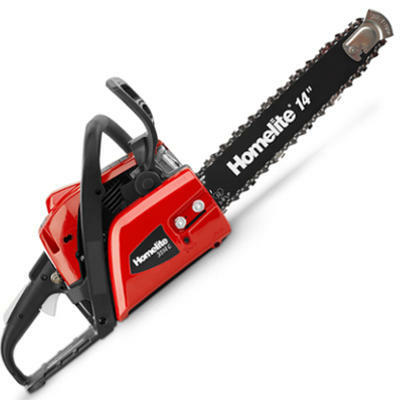 There are many happy customers when it comes to the 14 inch electric powered chainsaw from Homelite. It’s very underrated and has incredible performance. It also works well under pressure. Aimed at homeowners for light duties, this chainsaw still goes above and beyond to work for the user. It’s also very easy to maintain due to being electric, and requires no fuel. Check out what other people who purchased this product think about it. Read Homelite Chainsaw 14 inch electric chainsaw reviews. Homelite make the chainsaws, however, Homelite is a subsidiary of Techtronic Industries – an investment holding company in Hong Kong. Where are Homelite chainsaws made? Homelite chainsaws are now made in China. Where do you buy Homelite chainsaws? Homelite chainsaws are available at selected retailers all around the world. They are also for sale online, on websites such as Amazon. Online is the best place to get a good deal.